The Mobidea Academy has improved the lives of many affiliates out there. In previous articles, you were able to learn about the best practices to improve your performance, get some great tips on how to explore tracking systems to the max, learn cool tricks to optimize your campaigns and, of course, advice on how to set your budgets like a genius. In other words, this educational affiliate marketing platform has given you many different skills you should use to reach the top of the game as an Affiliate Marketer! No, we’re not gonna compare EPCs, payouts, or any other metrics from various affiliate networks. We know it could be kind of meaningless and boring after a while. So what will we be doing, exactly? We’ll explore the most popular payment methods affiliates should consider when selecting an affiliate network! Affiliate Payment Methods Can Never be Overrated! Most people choose their affiliate network by analyzing its range of offers, verticals, VIP perks, etc. When the time comes to pick a payment method and get that hard-earn cash, most folks feel like they can’t rely on any payment method to receive that much deserved revenue! Ready to check a shocking stat? The Tipalti survey measured user satisfaction with the state of affiliate revenue payments of over 250 global affiliate partners. It found that nearly 41% of affiliates have stopped working with an affiliate network because of a payment issue. Moreover, 65% guarantee they’d stop working with a network because of consistent payment problems. To make sure you’re never gonna become a part of those 65%, we’ve prepared a detailed analysis of the most famous Affiliate Marketing industry Payment Systems! Everyday, affiliates ask Mobidea’s Support Squad members a whole lotta questions about payment terms and conditions. Therefore, we’ve created our own list of the most important factors that affiliates value in payments. Based on these factors, we’ve analyzed the most common payment systems available on different networks. It’s important to mention that not all of them are available on our platform. Even so, the main focus here is to be impartial, allowing you to have a picture of the whole scenario. This payment system needs no introduction. 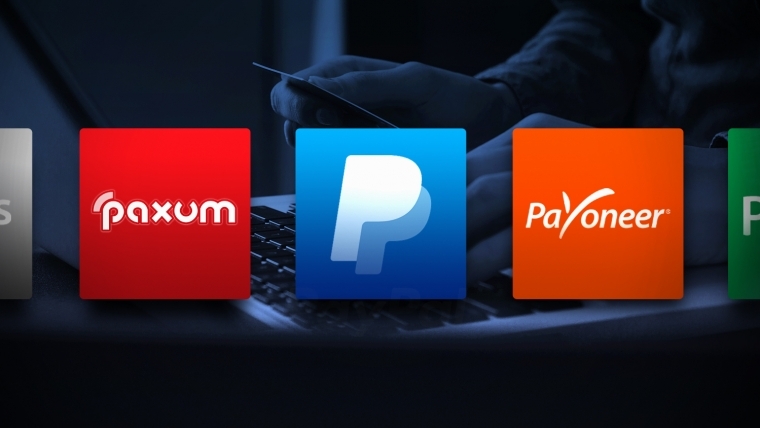 Whenever you think about online payments, PayPal comes to mind first! It’s a super well-known payment method. It’s based in the U.S. and available worldwide (with a few exceptions). In 2016, the number of active PayPal accounts reached 192 million in over 200 markets with 25 currencies. It first gained popularity as an easy and default payment option on eBay. Now, though, it operates as a payment solution for online merchants, auction sites, any commercial users and, of course, for affiliate networks. PayPal is basically an e-wallet that allows you to receive payments and transfer money between individuals and businesses. a) PayPal.Me, a peer-to-peer service for requesting payments platforms; b) PayPal Credit, an online service for crediting PayPal users. From an affiliate marketing perspective, PayPal offers an instant money transfer method with a reasonable fee (Mobidea charges a fee of only 2% for each PayPal transaction) accompanied by the opportunity to withdraw money to a user’s credit or debit card (additional fees are applied, depending on the card issuer). Another advantage of PayPal? Instead of cashing out, affiliates can pay for the goods and services of more than 15 million merchants worldwide. In particular, they can re-invest money in buying traffic from many Ad Networks (see table at the end of this article) or Facebook Ads. Overall, PayPal is a reliable, fast, and super safe payment system available on most affiliate networks and ad networks. Its commission fees to cash-out and its international transfers could both be lower, though a possibility to pay to millions of affiliate marketing players fast drives PayPal to our pedestal for one of the best payment systems for affiliates. First of all, FirstChoice Pay is available in 190+ countries. Unlike PayPal, it operates with over 150 different currencies. FirstChoice Pay’s second saucy feature has to do with its account types. Generally speaking, you can create a simple e-wallet, totally free of charge, or an account offering you a physical FirstChoice Pay Master Debit Card for global payments with a painful $29.95 yearly fee. In case transaction currencies are matched, an online purchase using that card will have no fees. This is a huge advantage over PayPal. Because not all businesses are gonna accept PayPal, while MasterCard processing is available almost for any online merchants out there! We won’t specify each and every possible FirstChoice Pay fees. Even so, we wanna highlight that FirstChoice Pay seems to be more profitable than PayPal if and when transfers/payments are received in a big amount/transaction. This is mainly because FirstChoice Pay’s offers a fixed fee on withdrawals in case the transaction currencies are the same. Last but not least, FirstChoice Pay’s Global Payment Service allows users to receive payments from companies based in the US, EU, UK and Japan as if they have a local bank account. This service can be extremely useful for affiliates who can claim a payment from their Network, since it’s a simple, straightforward bank transfer. Overall, FirstChoice Pay can be a brilliant solution for affiliate marketers since almost all popular affiliate networks provide it as a payment method. Are you learning more about these awesome payment methods? Know that you can find a whole lotta info by checking the two tables at the end! One of them shows you the ad networks and which of these specific payment methods they use and another one is a super cool table where you can find every detail you need to know about each of these affiliate payment methods! Paxum is another famous e-wallet payment method. Based in Canada, it’s available to users from all over the globe. It was designed by Webmasters, and it’s definitely focused on meeting the demand of Affiliate Programs, especially those which work with Adult traffic. Therefore, this system is present in many Adult networks – both the ones which sell traffic and the ones which help monetizing it. For example, Paxum is available on ExoClick, along with Paypal and wire transfers. On Mobidea, we’ll charge a flat fee of $1 for each Paxum transaction. Paxum has flat, straightforward fees. There are different ways of uploading and withdrawing your money through Paxum. A peer-to-peer transaction is gonna have a flat fee of $0.25. You can also go for an instant withdraw to the Paxum PrePaid card and withdraw your money at any ATM around the world or POS location where MasterCard is accepted. Another big plus: Paxum only charges a flat-fee of $2 for each ATM withdrawal. As for POS transactions, they’re free. On the other hand, this may not be a good option when doing a Wire Transfer, as Paxum charges a $50 fee. The yearly fee for Paxum’s PrePaid Card is $44.95. After you receive a payment on your account, you’ll be able to request this card and the money will be taken from your account. Paxum’s fees are lower than those of FirstChoice Pay. For example, if you’ve received a payment on your account, it’ll be accumulated on one amount. When you transfer all the accumulated money, you’ll be charged only $0.25 and the money will be instantly sent to your PrePaid MasterCard. In this specific case, it’s safe to say Paxum may be more convenient than FirstChoice Pay. Payza was created in 2008. It currently has over 9 million users, and operates in 195 countries with 21 different currencies. Some of PayPal’s embargoed countries are available on Payza. Payza perfectly adopted Paypal’s business model. It provides both a reliable gateway for businesses and a user-friendly, super affordable service for individuals. A great thing about Payza is that it tries keeping its fees low so that small businesses (Affiliate Marketers, in particular) can freely transfer cash to a bank account at low costs. Another key feature of Payza is that it allows Bitcoin transfers. In fact, adding funds to Payza accounts from Bitcoin is totally free of charge. If you wanna send money from Payza to Bitcoin, Payza is gonna ask for 2% of the transaction as a fee. It’s safe to say Payza is the most well-known payment method among systems which allow users to play with both Credit Card and Bitcoin. Payza’s number of merchants is less impressive than that of PayPal or FirstChoice Pay. Even so, the focus of the payment system is to provide a more competitive solution to businesses, allowing them to accept either one-time or recurring payments on their website. Indeed, Payza is now available on an increasing number of ad networks. ePayments is another cool payment method for you to explore. It was founded in 2011 so as to facilitate payments in the affiliate marketing industry. This convenient virtual payment method provides both an e-wallet and a Prepaid MasterCard payment solution for over 100 countries. Because – in order for you to top-up an e-wallet or withdraw funds – you can use many other online payment systems, for example, WebMoney, Bitcoin, Litecoin and, of course, a bank account. Plus: internal transfers between e-Payments’ wallets are free. Moreover, sometimes it’s even free to receive money from some affiliate networks. ePayments doesn’t charge any fees for incoming wire transfers. This – combined with the ePayments Prepaid MasterCard – can be a great opportunity for Freelancers, Affiliate Marketers, or any other remote workers. Nowadays, ePayments expands its services from the affiliate marketing sector to other industries including Forex, MLM, and digital currency. WebMoney is one of the most popular payment platforms in Eastern Europe and the countries which were part of the former Soviet Union. If you wanna purchase traffic, a web-hosting, or a domain in that region, WebMoney is the perfect service for you. This payment system currently operates in 91 countries with local currencies (purses in WMZ, WMR, WME, WMU, WMB, WMG, etc.) for national transactions, or in USD or EUR for global/international payments. However, many affiliate networks pay their publishers in USD. This means affiliates need to make sure they’ve set up a WMZ account. WebMoney Transfer also provides online financial services, P2P payment solutions, internet based trading platforms, merchant services, and online billing systems. One of the key advantages of using WebMoney is the fact that it’s got low fees. The transaction fee for a P2P transaction – which is paid by the sender – is 0.8% of the amount being sent but no more than 50 EUR. Another cool thing is that Webmoney has a dozen free services such as WebMoney Escrow, (which ensures the security of the transactions), Mass Payment Service, Debt Service, and a Fundraising Service via the WebMoney Funding platform. In addition to these features, you can also exchange funds you’ve got on WebMoney for other types of electronic money. You can also use the needed exchange points to get to the bank card and withdraw cash from an ATM. Skrill – formerly known as Moneybookers – is an e-wallet system with a truly global presence. Based in London and with offices in Europe and the United States, Skrill is available in around 190 countries and 40 currencies. You should go for it in case you see that other e-wallets aren’t accepted. Skrill is often used for online gaming. It’s well-known by every player in affiliate networks and it’s focused on keeping users happy with low fees. You can use your Skrill wallet for shopping online. What about receiving money on your account? Free! However, if you wanna send money to a mate, it’ll cost you a fee of 1.9% of the transaction (capped at €20). This value varies, depending on the country/currency. Skrill is gonna ask you for a fee of 3.99% for currency conversions. Uploading funds into your own account is free via bank transfer and Maestro card. For other methods (BitCoin, Neteller, etc. ), Skrill will charge you a percentage of the transaction. Skrill is free to join and has a free maintenance, as long as you use it every 12 months. Otherwise, it’ll charge you a monthly fee of €2. Neteller is one of the most popular e-wallets available in more than 190 countries and 22 currencies across different businesses and industries. It’s widely accepted in affiliate programs and the gambling sector. Neteller is a great option for transferring/withdrawing money online. It’s easy-to-use, quick and safe. Receiving money on your account is free. However, if you wanna send money to a peer, it’ll cost you a fee of 1.9% of the transaction (capped at $20). You can use many different devices to send money to Neteller such as credit cards, debit cards, bank transfers, a Paysafe Card, etc. There’s no fee for bank transfers. For other methods, the percentage fee will vary. Remember: if you go to the bottom of this remarkable Mobidea Academy post, you can find two wicked tables! 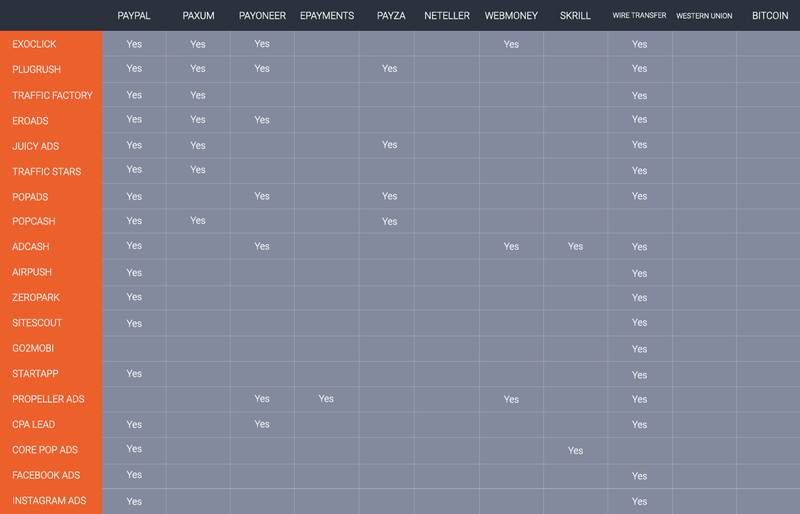 One is all about ad networks and lets you know which payment methods are available for each specific ad network! The other one is a complete and detailed list of pros and cons for each particular affiliate payment method! Of course, we couldn’t forget to mention one of the fastest growing payment methods: Bitcoin. In fact, it’s a new type of online currency or cryptocurrency, created in 2009. This payment method has several unique features that the aforementioned systems can’t really compete with. First, all the transactions are made with no interference from any middlemen or even banks which could help to lower transaction fees. Second, it doesn’t require any identification and keeps transactions anonymous (with no real name of a Bitcoin owner). Third, global transactions are easy and cheap since Bitcoins aren’t connected to any specific country and don’t depend on any governmental regulation. Many online businesses, merchants and vendors prefer using Bitcoins due to their zero fees from/to credit cards. Bitcoins are even used as an investment because of their high-value volatility. Nevertheless, one of the serious disadvantages of Bitcoins is that they don’t allow any refunds transactions. This obviously represents additional difficulties when exchanging Bitcoins for balance in other payment systems or credit/debit cards, and the other way around, too. Western Union is one of the oldest payment systems in our list. It was established in 1851 and remains one of the most popular payment solutions all over the world. It’s available in over 190 countries and operates with more than 130 different currencies. Once famous by its cash-to-cash overseas transaction, Western Union now supports a straightforward online transfer process. In fact, a money-sender can easily transfer from an online interface to a WU wallet. Even so, fees to transfer money either online-to-cash (via card processing) or cash-to-cash are regarded as quite the expensive option. Western Union’s key focus is the kind of transactions to recipients who don’t have a bank account. The receiver will only need to show two valid identification cards + tell the money transfer control number (MTCN) and other info required on the receiver’s end. However, taking Affiliate Marketing specifics into account, this method doesn’t seem convenient enough for affiliates who need to collect the money in cash and will later have to re-invest to continue their activity. Wire transfers, meaning bank transfers, are the most popular payment method all over the world. However, payments aren’t fast, and fees are higher (no universal commission) compared to other payment methods in the market. Moreover, intermediary banks have their own rules. These rules can screw your money making plans big time! Mobidea charges 0.99 euros for bank transfers in the European Union and 4 euros for those outside of the EU. To sum up our analysis, there are indeed many payment solutions provided in the affiliate marketing industry. Each of these has its own advantages and pitfalls. While some were designed specifically for the purpose of affiliate marketing (such as ePayments, Paxum), others provide a broader number of services (PayPal, Webmoney, Skrill), and some will be able to offer the lowest fees (Payza, FirstChoice Pay). It can be challenging to choose the best payment systems when there are so many of them popping like wild mushrooms. We encourage you to weigh the pros and cons of each payment solution and check your needs before understanding which payment solution best fits your style. Maybe you think PayPal isn’t gonna be the best thing for you, since it’s got some high fees. It may be that Payza, Paxum or FirstChoice Pay’s e-wallet serve all your needs at a much lower cost. Another piece of advice? Pick affiliate networks that provide a broad choice of payment methods. The more payment options you find in an affiliate network, the more confident you’ll feel, because you know you’ll be able to withdraw your revenue quickly/safely. Mobidea suggests its users 6 different payment solutions: PayPal, FirstChoice Pay (a sub brand of FirstChoice Pay), Paxum, Payza, ePayments, and Wire Transfer. Make it rain without pain! We wish you take advantage of fast payments and low fees! Also, we promise to ensure on-time payments and to add even more payment solutions in the near future. Got great questions about Affiliate Payment Methods? Propeller Ads Review: Is It Worth?